Ooh, I love Jimenez' work. Great to see other pros joining in the fun. And part of his comment: "Nothing crazy or modern; just trying to replicate a retro feel, inking what's there (what I can make out in the scan). Big and chunky lines and black masses. Super oldschool and lots of fun. He still knows what he's doing!" I too love George Perez and by some extension, have enjoyed Phil's work. However, I never really like and JB/GP crossovers. Just not convinced their styles work well together, for me. 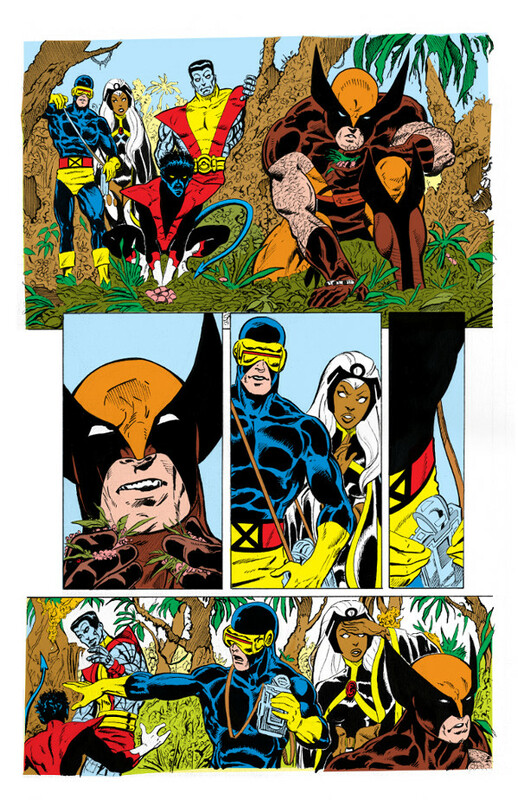 And while it is grossly unfair to judge a collaboration based on a handful of lines over two incomplete panels. This doesn't fill me with any expectation beyond what I have mentioned already. "Just not convinced their styles work well together, for me." I do echo the thought that board-member Phillipe raises that it adds Kudos to the project and maybe momentum to a recognition of Johns evident skills and their lack of presence in the modern industry. However, I do feel like there is the potential for thing to wiff of 'try-outs'. Which I promise you would not exist in my timeline!! Phil Jimenez shared on Instagram today that he is trying his hand at inking some of these pages. I wonder why he sent Kurt to the barber? ...the potential for thing to wiff of 'try-outs'. In his post, Phil said he was doing this to "warm up" for inking a project he is working on and doing it "just for fun". This isn't meant to be a publication-ready, fully finished product; nor is it meant to be a try-out for a project that doesn't even exist (yet?). Apologies if that wasn't clear in my original post. I've always wondered how you drew bits of 'Kirby' machinery (inside ships, danger room, etc) with such precision. It seems like that would take forever using rulers and round Helix. I use a french curve, and often an elliptical template. But just as often I opt for freehand. I find myself wondering if it would be more efficient, both for myself and the inkier if, instead of tracing the images onto the page, I pasted in a line rendering of the model(s). Certainly would be sharper and crisper, for the inker to work over. I've added a link to the Sequential thread to the first post in this thread. Should help people to find it!! I thought their styles meshed beautifully in ACTION COMICS #600. Taste is taste, of course. Phil Jiminez is a great penciller but the inker he usually works with (Andy Lanning? I can't remember) isn't a good fit for him, in my opinion. My attempt-in-progress at coloring this page in retro style. Nothing flashy, I am old school, bright/fun colors are all you need.The inker is Scott Barnett. Still some work to do here, but I must say this is quite fun! Even "retro style" would have a greater range of tones in the backgrounds. I'm still fooling around with the backgrounds JB.Were you speaking if the sky in particular? I'm thinking of lightening up the background so the characters are more the focal point. In a deep, dark, dense jungle, I don't think "lighter" would be the way to go. I suppose not, I've been back and forth several times. I could always make this a dusk/night time scene. Was there mention of the time of day this might take place? I could always make this a dusk/night time scene. Was there mention of the time of day this might take place? Sunlight streaking down thru the canopy...? I'm seeing here an all too common concentration on HOW you are coloring, over WHAT you are coloring. I'm not an expert but Colossus has the same blue color as the sky!!! Indeed he does. Digital coloring is very forgiving, I'll be changing that. Thanks JB for your input. Much appreciated! 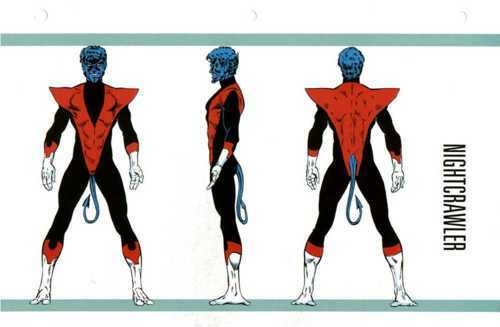 Rob, you might consider adding Nightcrawler's plunging back neckline since it is black and can be added with you colours very easily. I've been noticing people scattered around the web overreacting (!!) to my comment that these ELSEWHEN pages have been "falling out of my pencil" at the rate of about one per hour. Again, it seems, I must emphasize that this is an average. with some taking longer, and some taking less. It's all about what's in the pictures. Kitty's solo adventure, with more detailed technical backgrounds, took more. When I started, It took me about two hours to do a page of full pencils. One of the things that got me my first work at Marvel, in fact, was my speed. Production Manager John Verpoorten loved the fact that he could send me a 17 page plot and expect in back in less than 10 days. Fortunately, as I got technically more proficient, I did not lose my speed, and, in fact, as I have learned just how much can be entrusted to the inker (not having to fill in black areas completely, for instance) my penciling speed has increased. That is such a great skill - It's one thing to be fast and just average, but to be that fast and produce high quality art is impressive! When you start, do you already 'see' the whole page? Do you do those tiny thumbnails first?